Do you know if at least some of those wispy clouds were dissipated airplane contrails? It did not register on my awareness at the time. It is possible, given the shapes. It does take over the photograph. So peaceful with the panoramic view. Seeing the landscape, the vegetation, and the sky makes the video an uplifting gallery of God’s immense creation. Michael, thanks for sharing. Isn’t that fantastic? The photo was not enhanced, the sky and like in Arizona is indescribable, especially early spring, when this photo was taken. Look at that sky! What a lovely place, captured so well. The light in your image is spectacular, wonderfully captured. Have a nice day Michael!!! Thank You, Efi. 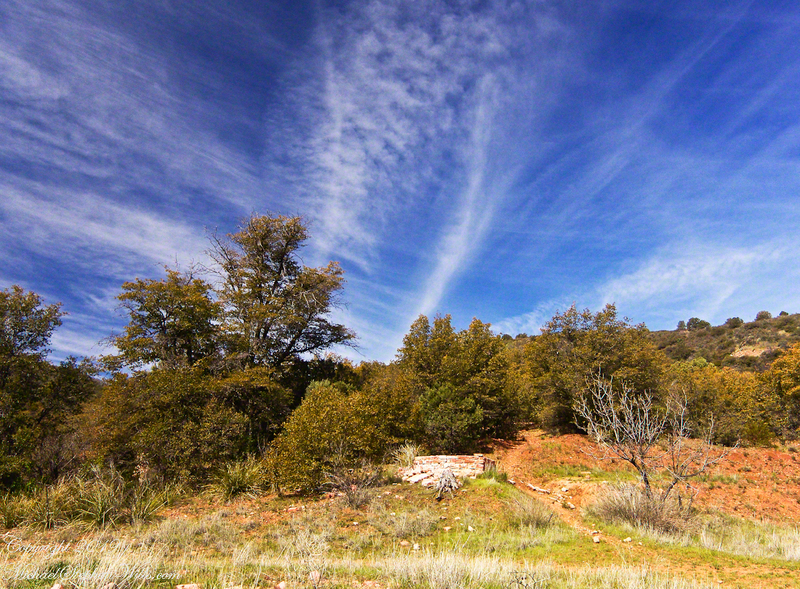 Arizona light is stupendous, especially late fall and early spring. Good morning from Athens Michael!!! Wonderful place !!!! Your video reminded me of the outback in Australia. It can be so quiet and peaceful. I look back now and contemplate taking more materials, then remember how difficult it was to take when I managed to. Good to hear your favorable response, Carolyn.